Hoje o meu postal é minimalista. Foi inspirado em CAS Colours and Sketches (para o esquema) e Less Is More (usei apenas três carimbos, pois esse é o tema desta semana). 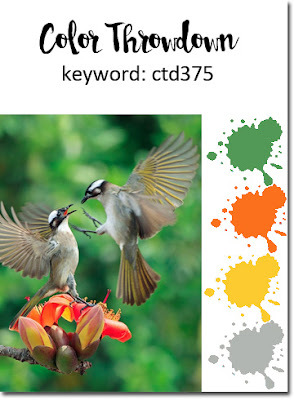 Para as cores, inspirei-me em The Card Concept. Este é um estilo de postal que eu poderia considerar Clean and Simple. 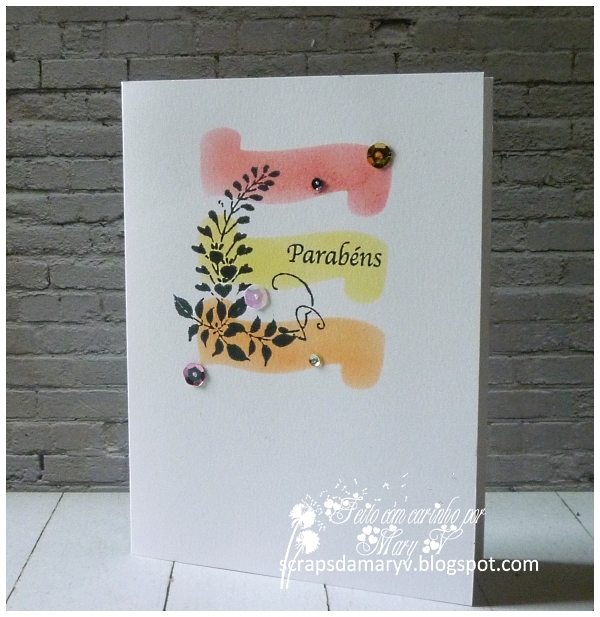 As flores, que lembram a primavera, estão em Creative Corner Challenges. 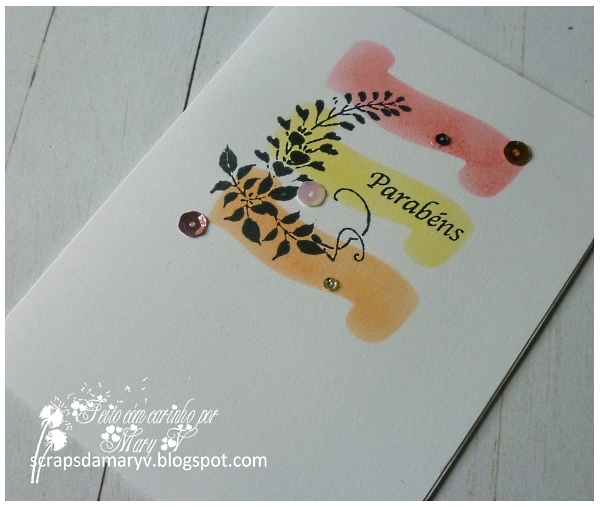 Today it's a CAS card inspired by some challenges: CAS Colours and Sketches (this week it's a sketch); Less Is More (I've used three stamps, which is this week's theme); The Card Concept for the colours; and Creative Corner Challenges because it's all about Spring flowers. Obrigada por visitarem! Bom fim de semana! Thank you for visiting! Have a great weekend! Hoje mostro um postal de aniversário feito com a técnica de "one layer". Todo o postal está feito na base, sem qualquer outro papel. Foi apenas feito com carimbos e decorado, de forma quase minimalista, com lantejoulas. 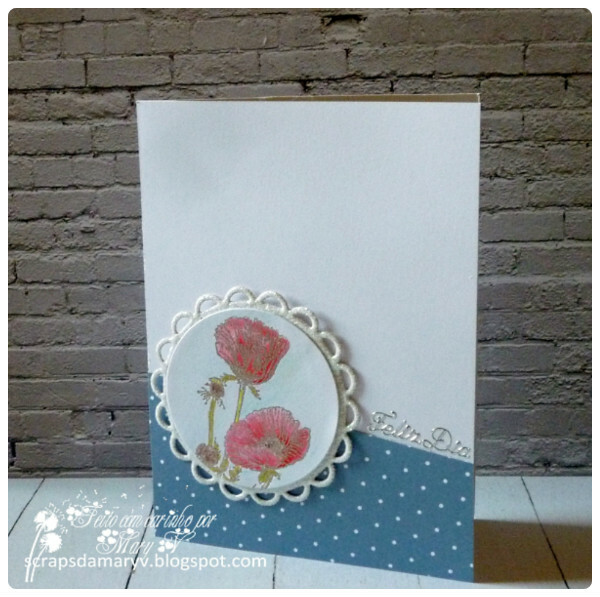 Today it's a one layer birthday card just because that's what's this week's all about at Less Is More. I pre-cut the geometric shapes onto a piece of printing paper and then used it as a mask to insert the colour. 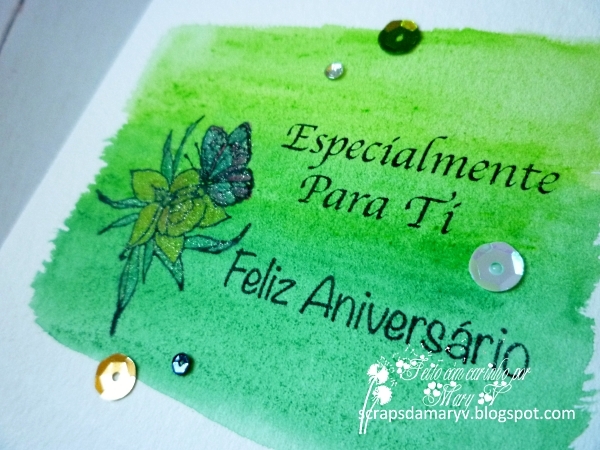 Then I stamped the flower and the sentiment and finished with a few sequins. Um simples olá e desejos de que o vosso fim de semana seja excelente! Pois este é hoje o tema do meu postal. Simples e cheio de flores porque é isso que vejo da minha janela, apesar da chuva ocasional! Just a simple Hello! Wishing that the weekend is great! 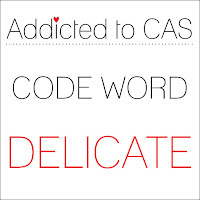 Well, this the theme for my card today. Simple and filled with flowers because that is what's outside my window. Love this time of the year except for the rain! You can find the Docerela Challlenge #98 HERE. 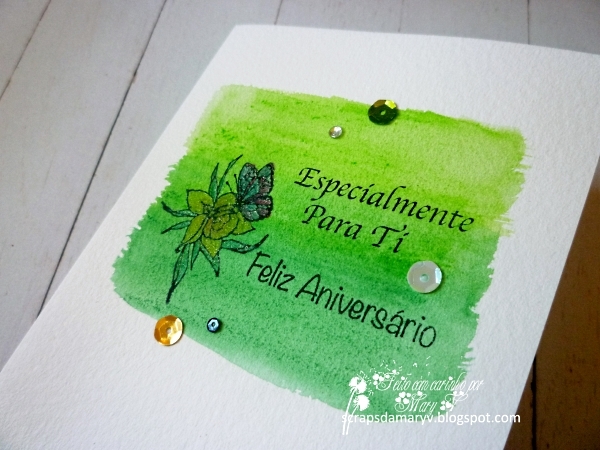 Gostaria de começar por dizer que me sinto muito feliz por ter sido convidada para membro da equipa de design no novo projeto do blogue Creative With Stamps. Vai começar a 1 de Abril, é um desafio para quem gosta de fazer postais e usa habitualmente carimbos. Este desafio vai decorrer todos os meses e haverá prémios para os melhores trabalhos. Darei mais pormenores nos próximos posts deste blogue. 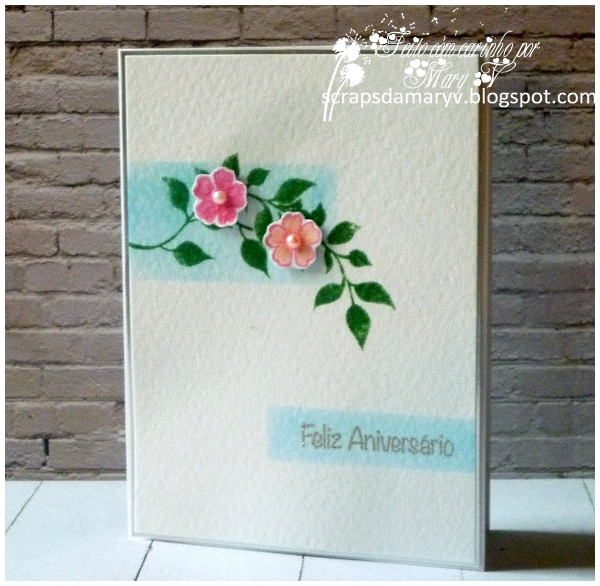 Hoje trago um postal de aniversário feito sobre a base do postal (técnica One Layer). Comecei por fazer uma base de tamanho A6 (standard). Depois usei lápis de cera de aguarela em dois tons de verde e usei água e um pincel para misturar as cores. Tentei que o resultado final tivesse um efeito gradativo. Em seguida estampei o sentimento e a flor. Para esta, usei lápis para dar alguma cor, mas sem a tornar o foco principal. Neste caso o sentimento é o mais importante, uma vez que esta semana, em Less Is More, esse deve ser o elemento principal. Usei carimbos da Docerela. Para além deste desafio, inspirei-me em outros que poderão ver no final deste post. 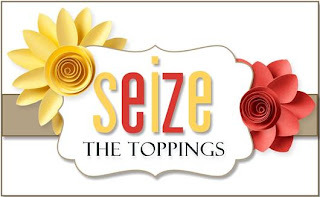 Let me start by saying that I feel very honoured to have been invited for a new challenge blog project (Creative With Stamps) starting next month. 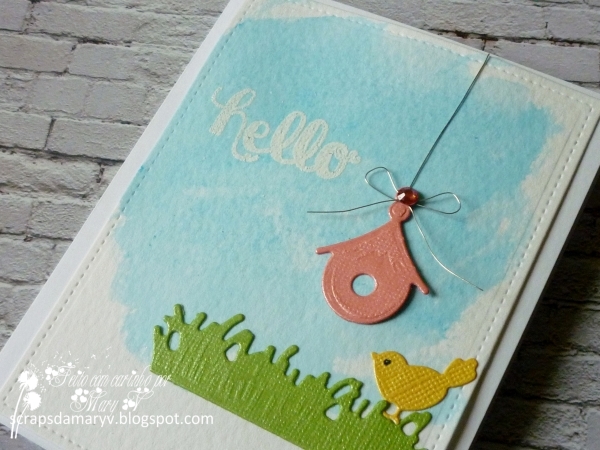 It's a monthyly card challenge where the participants have to use stamps for their creations. 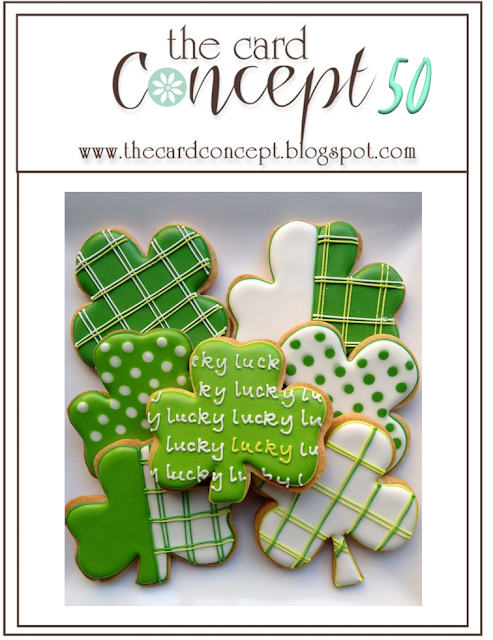 There will be prizes, of course and I promise to give you more details throughout March. So, stay tuned! 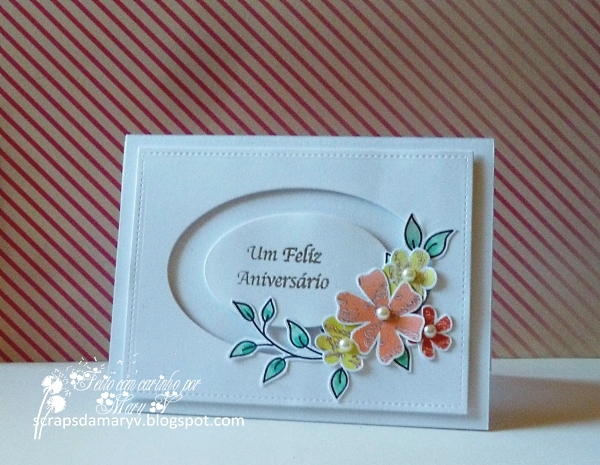 Today I'm showing you a clean and simple one layer birthday card. 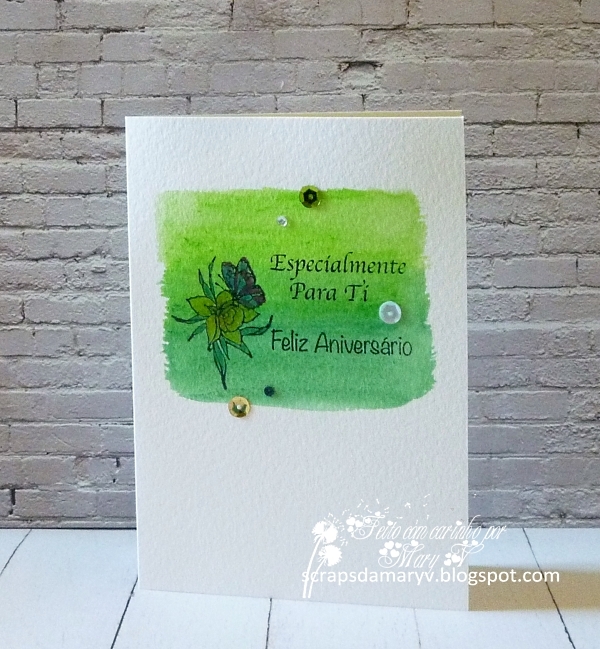 On my watercolour card base I used some watercolour crayons in two shades of green and then applied some water. I tried to give it an ombré look. 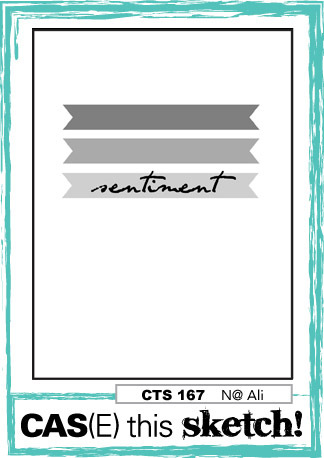 Then I stamped the flower and the sentiment. For the first I also added some colour but this time using pencils. I didn't want to give the flowers very strong colours so that the sentiment would stand up. 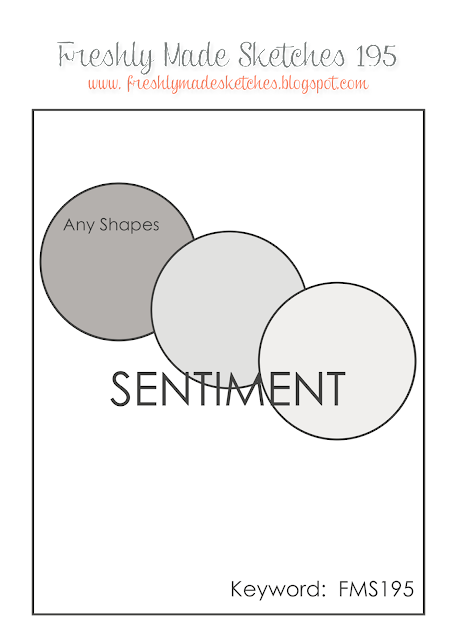 I was mainly inspired by this week's challenge at Less Is More, which is one layer with the sentiment as the focal point. I was also inspired by some other chalenges. You can see which, at the end of this post. Gostaria de começar por lembrar que existe uma chamada da designers no blogue da Stamprints. Não deixem de visitar e conhecer as condições para concorrer! A minha amiga Lilian espera por vós para o início deste novo projeto. Acreditem que vale a pena! Hoje mostro um postal dedicado ao Dia da Mãe. 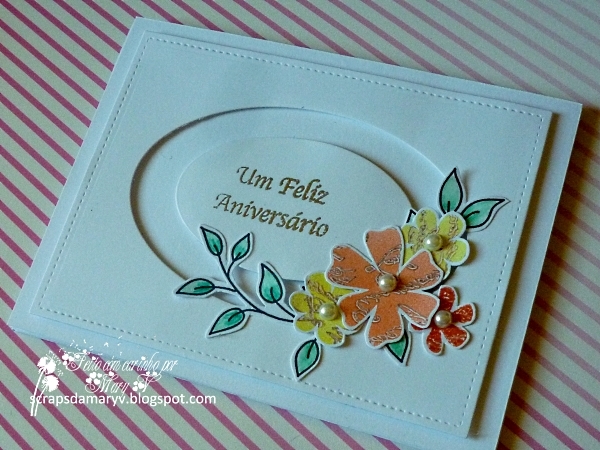 Comecei por carimbar as flores com tinta transparente para embossing e usei pó de embossing prateado. Depois de derretida a imagem, pintei-a com aguarelas. 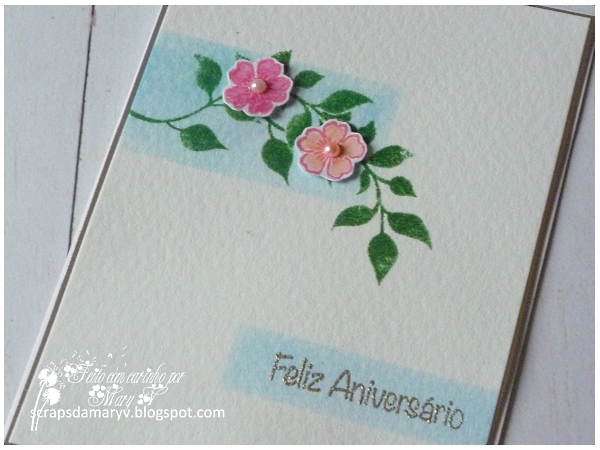 Cortei o círculo com as flores e depois cortei outro círculo com papel de glitter. Para o sentimento usei um peel-off. If you are a frequent visit to my blog, you'll notice that very rarely have I posted on a Sunday, but I have some news for you. There's a Design Team Call at Stamprints. 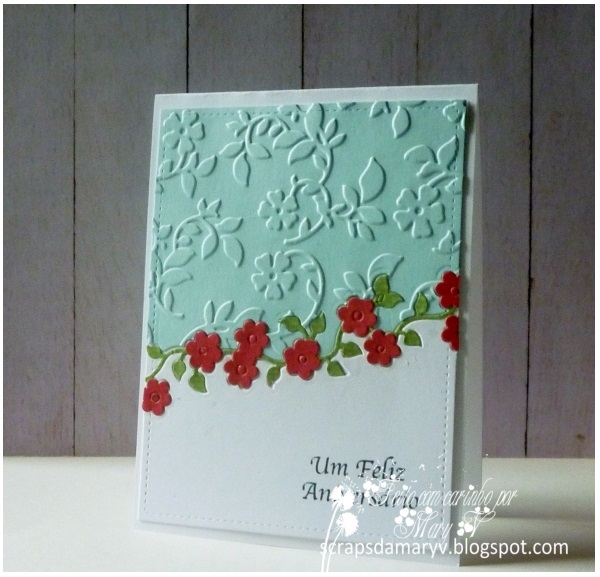 Today I'm showing you a Mother's Day card. 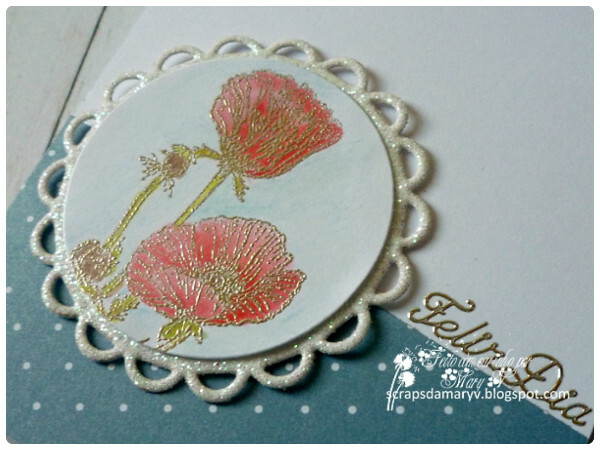 I started by stamping the flowers with Versamark and then used silver embossing powder. After melting the powder, I painted with with some watercolour markers. Then I cut the circle and another scalloped one using glitter paper. For the sentiment I used a peel-off. AQUI está o Desafio Docerela 97. Hoje o desafio de Less Is More é usar arame. Depois de algum debate de pensamentos, acabei por usá-lo de forma muito simples na casinha do pássaro. Aqui está um material muito raro e que nunca tinha usado antes em postais. 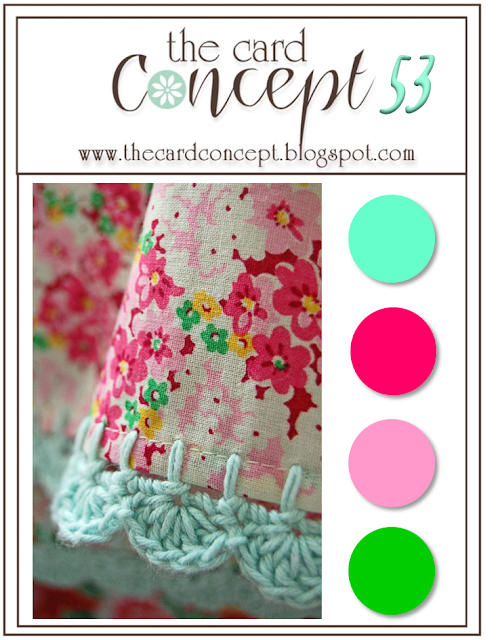 Quanto ao layout, este foi inspirado em CAS Colours and Sketches. Today's challenge at Less Is More is to use wire. After some brainstorming, I ended up using it in the bird's house in a very simple way. I have to confess this a first. Never before had I used this material i my cards but it's definitely something to go back to in the future. 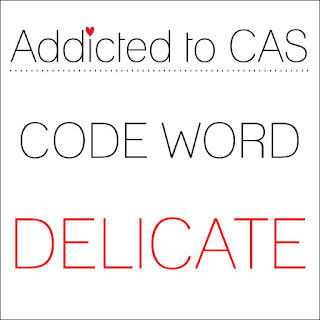 For the card sketch, this time I've used CAS Colours and Sketches. 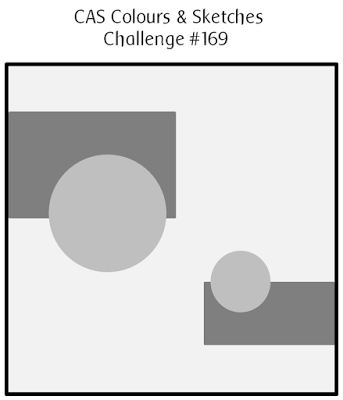 If you are looking for the Docerela Challenge #94 clic HERE. Hoje o desafio em Less Is More é uma técnica que, traduzida do inglês, se chama "beijar". Na verdade é muito simples. 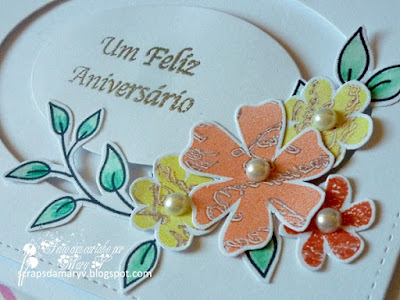 Escolhi um carimbo de flores da Artemio e estampei a flor que queria, primeiro numa cor de fundo (laranja, por exemplo), depois passei essa flor por um outro carimbo (com letras) levemente manchado de castanho, Estampei em papel branco e aqui está o resultado. Depois de recortar as flores, fiz o arranjo no postal, tal como se vê nas fotos que vos deixo a seguir. Today it's all about kissing, the technique, of course. I have to confess I had never tried this before but after following the instructions at Less Is More I knew I had to give it a go. 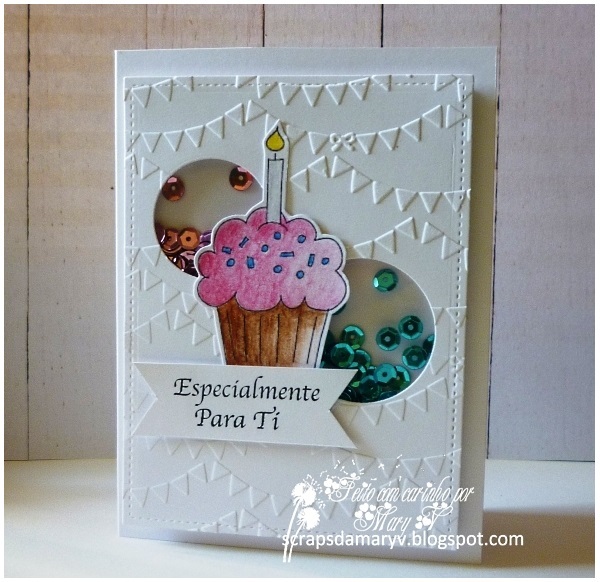 First I chose my stamp, in this case an Artemio one I had in my stash. I stamped each flower in the base colour (in this case orange and yellow) and then I kissed the stamp onto another one with letters. To give that effect I used a brown ink. 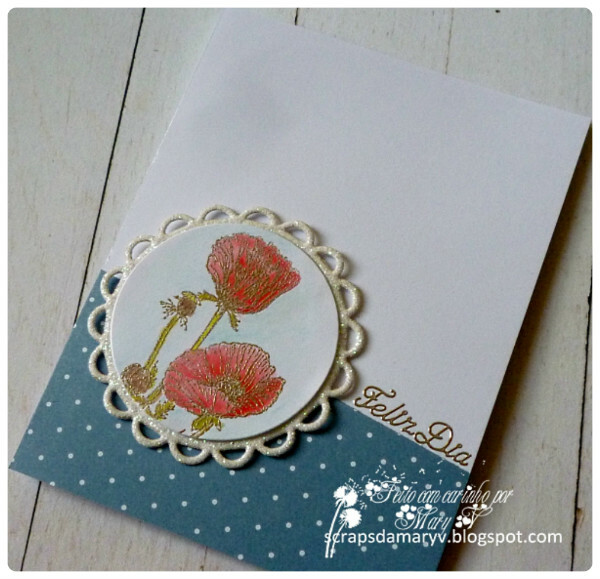 Finally I stamped the flower on a piece of white card stock and fussy cut it. In the middle of the flowers I decided to use some pearls, just to give it some bling. And that's it for my learning process. Thank you Less Is More for teaching me! O postal de hoje é para um aniversário de casamento. É feito com cortantes e com uma técnica que eu adoro: embutir. Para a realização do postal, foram feitos diversos cortes nas diferentes cores, que depois foram colados para compor o postal. Espero que gostem e tenham um bom fim de semana. 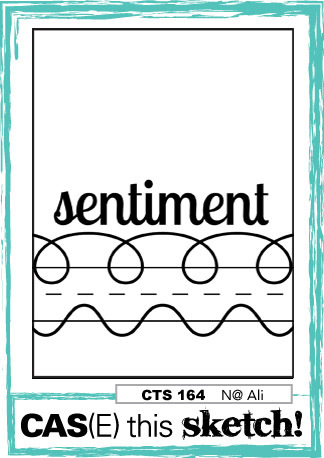 Today's card is for a wedding anniversary. It's made using dies and one of my favourite techniques; inlaying. To make this card, I've cut the different papers several times and then glued them back in place so that the colours would combine. This is the end result, which I absolutely love. Enjoy and have a wonderful weekend! 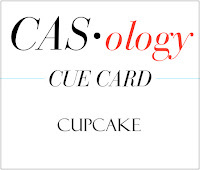 Hoje quero mostrar um postal inspirado em três desafios: o tema "Cupcake" é de Casology. Esta semana um tema muito doce sem fazer engordar. O esquema é de Freshly Made Sketches. A minha cabeça deu voltas até conseguir imaginar um postal em que os círculos são interactivos. Há lantejoulas que mexem quando abanamos o postal! Fixe, não? Quanto às cores escolhidas, bom essas são de CAS colours and Sketches #133. Espero que gostem e espero que tenham um bom resto de semana! Today my card was inspired on three chalenges: the theme is from Casology. 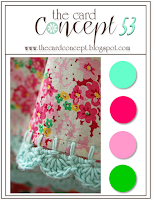 Very sweet theme and with no inconvenient. Things like these on a card won't make you fat! 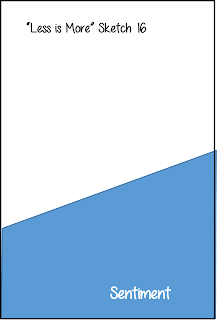 The sketch is from Freshly Made Sketches. I had a bit of a struggle to put this shaker card together. But I think the end result is quite nice and sweet. For the colours, this time I was inspired by CAS Colours and Sketches #133. Enjoy!